BUDDHA or Enlightened One-lit. Knower or Awakened One-is the honorific name given to the Indian Sage, Gotama, who discovered and proclaimed to the world the Law of Deliverance, known to the West by the name of Buddhism. The Buddha is neither a god nor a prophet or incarnation of a god, but a supreme human being who, through his own effort, attained to Final Deliverance and Perfect Wisdom, and became 'the peerless teacher of gods and men.' He is a 'Saviour' only in the sense that he shows men how to save themselves, by actually following to the end the Path trodden and shown by him. In the consummate harmony of Wisdom and Compassion attained by the Buddha, he embodies the universal and timeless ideal of Man Perfected. 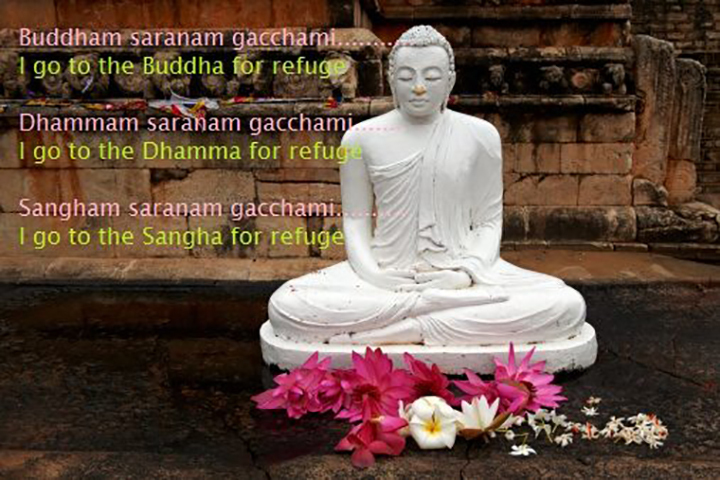 The Dhamma is the Teaching of Deliverance in its entirety, as discovered, realized and proclaimed by the Buddha. It has been handed down in the ancient Pali language, and preserved in three great collections of hooks, called Ti-Pi.taka, the "Three Baskets," namely: (I) the Vinaya-pi.t aka, or Collection of Discipline, containing the rules of the monastic order; (II) the Sutta-pi.taka, or Collection of Discourses, consisting of various books of discourses, dialogues, verses, stories, etc. and dealings with the doctrine proper as summarized in the Four Noble Truths; (Ill) the Abhidhamma-pi.taka, or Philosophical Collection; presenting the teachings of the Sutta-Pi.taka in strictly systematic and philosophical form. The Dhamma is not a doctrine of revelation, but the teaching of Enlightenment based on the clear comprehension of actuality. It is the teaching of the Fourfold Truth dealing with the fundamental facts of life and with liberation attainable through man's own effort towards purification and insight. The Dhamma offers a lofty, but realistic, system of ethics, a penetrative analysis of life, a profound philosophy, practical methods of mind training-in brief, an all-comprehensive and perfect guidance on the Path to Deliverance. By answering the claims of both heart and reason, and by pointing out the liberating Middle Path that leads beyond all futile and destructive extremes in thought and conduct, the Dhamma has, and will always have, a timeless and universal appeal wherever there are hearts and minds mature enough to appreciate its message. The Sangha-lit. the Assembly, or community-is the Order of Bhikkhus or Mendicant Monks, founded by the Buddha and still existing in its original form in Burma, Siam, Ceylon, Cambodia, Laos and Chittagong (Bengal). It is, together with the Order of the Jain monks, the oldest monastic order in the world. Amongst the most famous disciples in the time of the Buddha were: Saariputtawho, after the Master himself, possessed the profoundest insight info the Dhamma; Moggallaana, who had the greatest supernatural powers: Ananda, the devoted disciple and constant companion of the Buddha; Mahaa-Kassapa, the President of the Council held at Rajagaha immediately after the Buddha's death; Anuruddha, of divine vision, and master of Right Mindfulness;Raahula, the Buddha's own son. The Sangha provides the outer framework and the favorable conditions for all those who earnestly desire to devote their life entirely to the realization of the highest goal of deliverance, unhindered by worldly distractions. Thus the Sangha, too, is of universal and timeless significance wherever religious development reaches maturity. The Buddha, the Dhamma, and the Sangha, are called 'The Three Jewels' (ti-ratana) on account of their matchless purity, and as being to the Buddhist the most precious objects in the world. These 'Three Jewels' form also the 'Threefold Refuge' (ti-sara.na) of the Buddhist, in the words by which he professes, or re-affirms, his acceptance of them as the guides of his life and thought. After the formula of the Threefold Refuge follows usually the acceptance of the Five Moral Precepts (pa~nca-sila). Their observance is the minimum standard needed to form the basis of a decent life and of further progress towards Deliverance. Paanaatipaataa veramani-sikkhaapadam samaadiyaami. I undertake to observe the precept to abstain from killing living beings. Adinnaadaanaa veramanii-sikkhaapada.m samaadiyaami. I undertake to observe the precept to abstain from taking things not given. Kaamesu michcaacaaraa verama.ni-sikkhaapada.m samaadiyaami. I undertake to observe the precept to abstain from sexual misconduct. Musaavaadaa verama.ni sikkhaapada.m samaadiyaami. I undertake to observe the precept to abstain from false speech. Suraameraya - majja - pamaada.t.thaanaa verama.nii-sikkhaapada.m samaadiyaami. I undertake to observe the precept to abstain from intoxicating drinks and drugs causing heedlessness.